I was given a year subscription to Glossybox for Christmas from my husband. He knows me so well and this was his way of helping to support me in a quest to better my blog and support my addiction. Huge thanks to the man who can make anything happen! Please hang in there for this extra long post, the regular series will never be this long again. 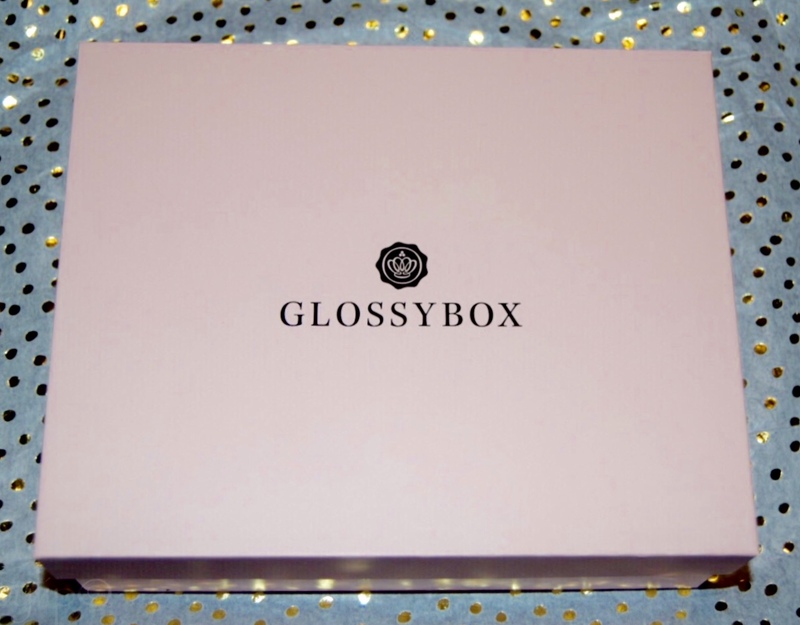 Glossybox is beauty subscription service that costs $21/month and is filled with 5 niche, high-end, and emerging brands. If you are interested in subscribing you can check it out here. 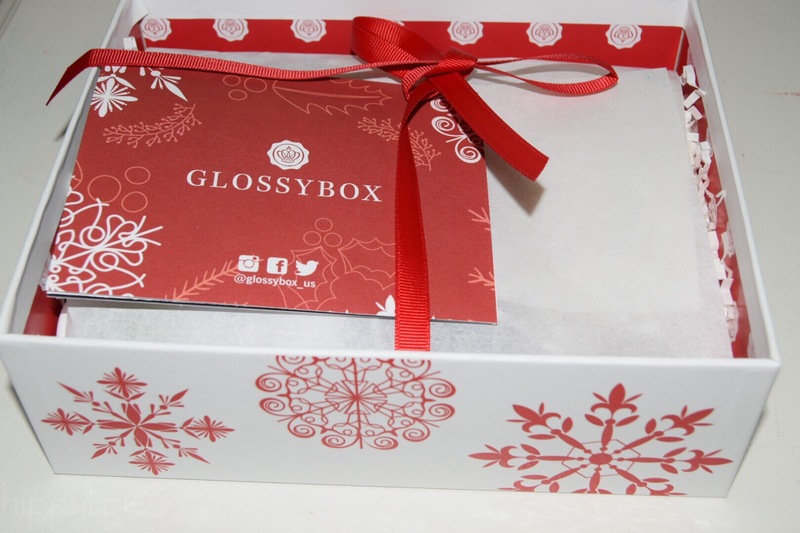 If you are interested in the many brands Glossybox offers you check them out here. They give you the opportunity to fill out a beauty profile to assist Glossybox in curating a box tailored to you. They also have a point system where you can earn points by filling out surveys and referring friends. When you reach 1000 Glossydots you earn a free box of your choosing. Since this subscription started late in December, I decided to add the December unboxing in an effort to catch up. December’s packaging was just too cute to leave out anyway! I just have to say that Glossybox really has the best packaging when it comes to monthly subscriptions. One other unique perk with Glossybox is a very handy card that gives tips on how to use each product (genius). The December box was appropriately festive with a red & white theme. It was so pretty that I almost wanted to leave it undisturbed. After I untied the red ribbon I found the products sitting on a bed of white confetti. Packaging is everything!! I was totally impressed by the presentation, but that doesn’t mean I will overlook any products that don’t hold up to what they say. Color Club- Feverish nail polish. Full-size $8.50. Tip: allow 2 minutes between layers of polish. 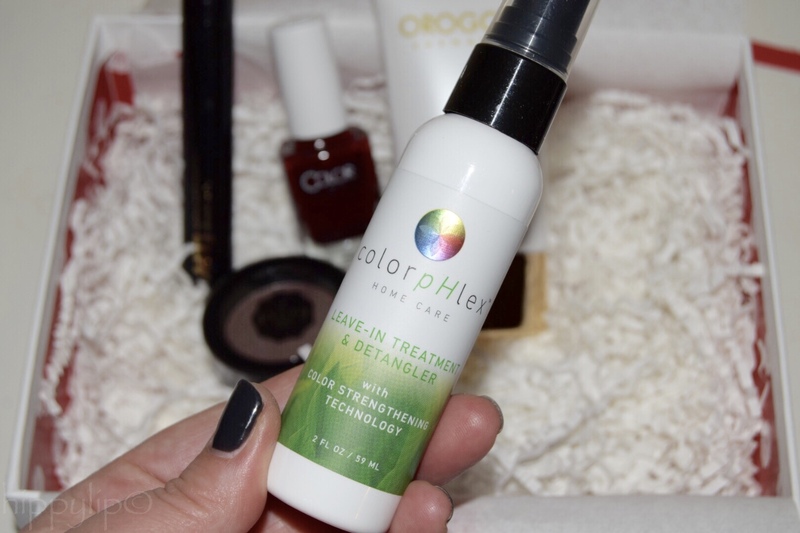 Colorphlex- Leave-In Treatment & Detangler 2 oz. Approximate value $6.00 Full-size $22.oo. Tip: Grape seed extract restores sebum, lost du to aging, to the scalp. 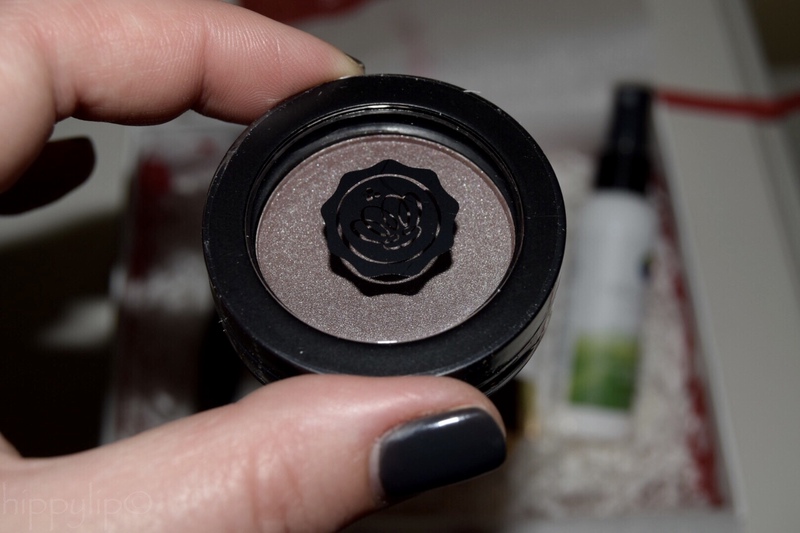 Glossybox in Mauve Eyeshadow. Full-size $11.00. Tip: Add a metallic silver to the inner corner of the eye to enhance shape & blend darker colors. MTJ Cosmetics- High Definition Mascara. Full-size $21.00. Tip: Add 2-3 drops of saline to keep our mascara from drying out halfway though. 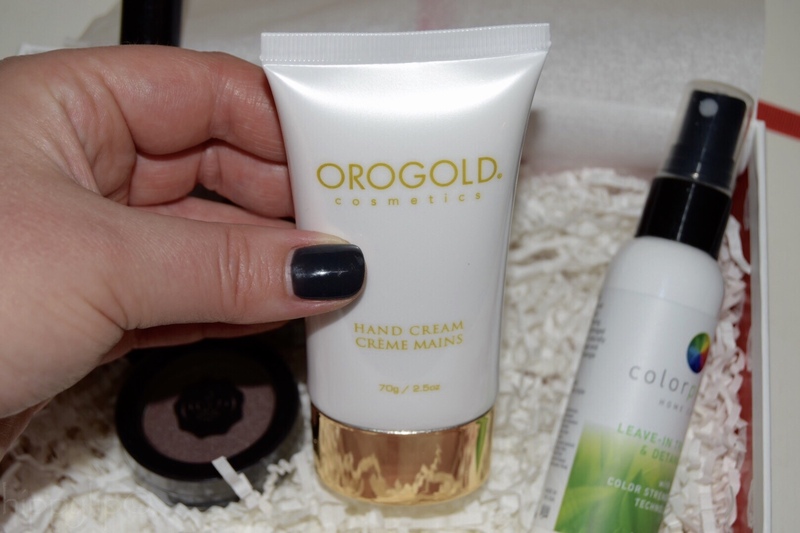 Orogold- 24K Hand Cream 1 oz. Full-size $18.00. Tip: Combine this cream with cotton gloves and wake up with hydrated hands. The total of this box is approximately $64.50. First Impressions: Not impressed at all. For $21/mo I was expected items that fit my beauty profile a little more. 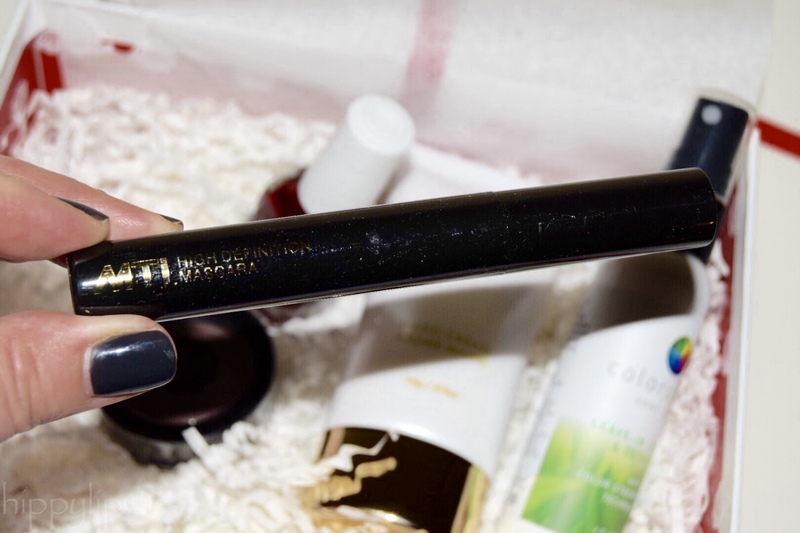 Hey, I love the mascara and it even has the potential to remain a staple in my makeup collection. I am totally not into monthly subs making their own brands and slapping a price on there. I look at as if you can’t get enough products so you are making your own to fill the boxes. I was expecting an array of niche, high-end, and up and coming brands as stated. Ok, done ranting (Birchbox is doing the same and I am not happy). The eyeshadow really is a cool shade and I will definitely give it a try. The hand cream would’ve been amazing if the scent didn’t stay all day and make me nauseous. I never paint my nails and I fill out all profiles indicating that and I still received a lovely shade of red that almost made me attempt to paint my own nails. Lastly, it’s also in my profile that I have fine/thin hair and I get a detangler?? I am giving GB the benefit of the doubt because this was my first box and it was ordered late in the month, maybe they didn’t have time to match my profile and wanted to get it out quickly, which I do appreciate. Now let’s move on to January, which is MUCH better. Emile Make Up- Diamond Heart Base Primer 15mls. Approximate value $15.00. Full-size $29.00. Tip: This can be worn alone or as a base for makeup. 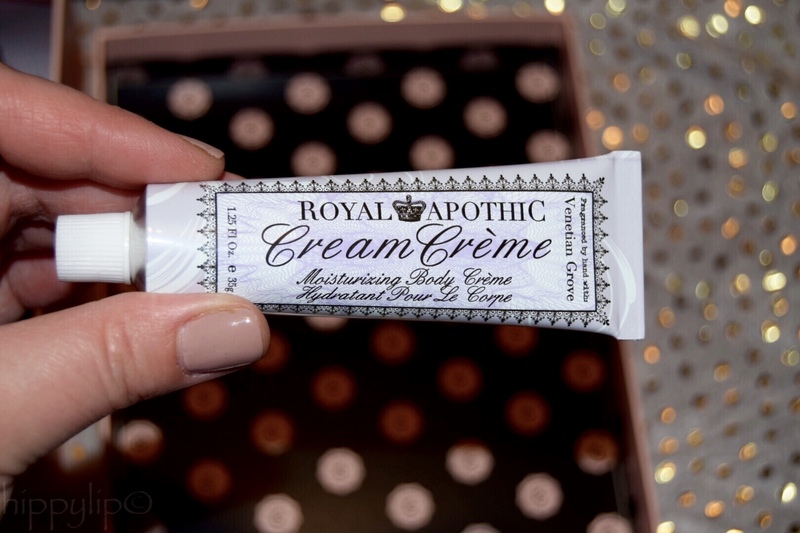 Royal Apothic- Cream Creme To Go 1.25 oz. Approximate value $14.00. Full-size $14.00. Tip: Lactic acid has been used for centuries and it’s believed Cleopatra soaked in baths of donkey’s milk and rose petals. 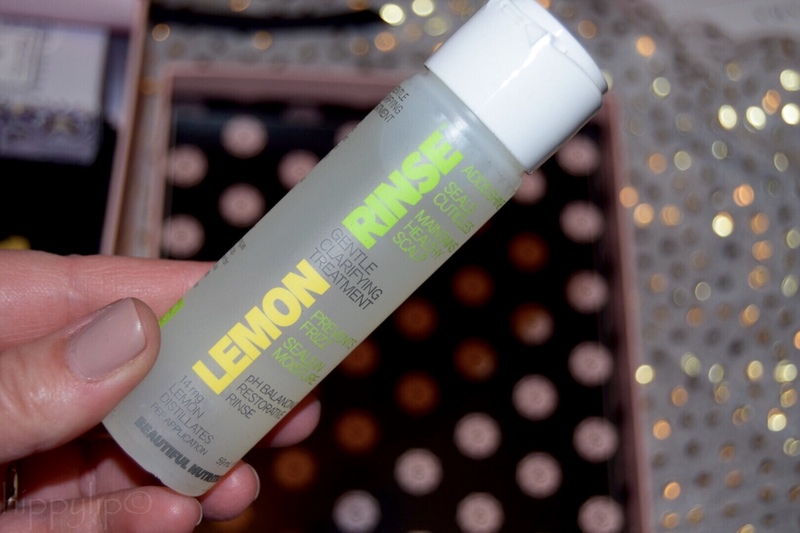 Beautiful Nutrition- Lemon Rinse Gentle Clarifying Treatment 59mls. Approximate value $2.00. Full-size $10.00. Tip: Once a week, after cleansing & conditioning, saturate from root to tip and rinse after 30 seconds. 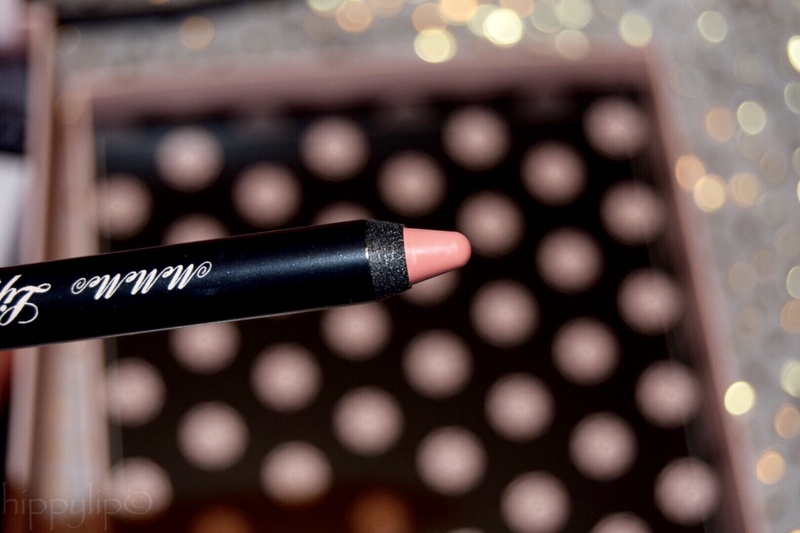 MeMeMe- Lip Glide in Playful Peach in full-size. Full-size $12.50. Tips: Rub a lip scrub on your lips prior to applying lipstick. 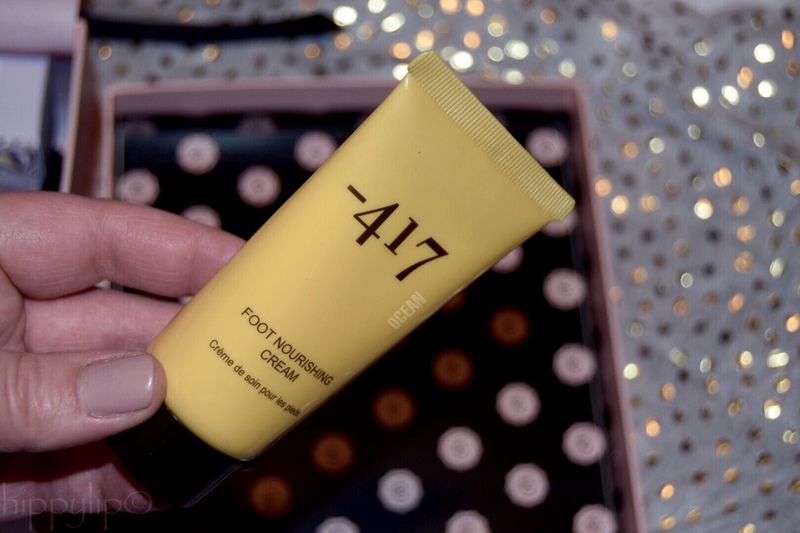 Minus 417- Foot Nourishing Cream 1.25 oz. Approximate Value $8.00. Full-size $16.00. Tips: The dead sea is said to have over 21 minerals believed to remedy skin. The total approximate value of this box is $51.50. Impressions: First of all…..another hand cream? And if that wasn’t enough, I received a foot cream too! Seriously? lol. I do love Minus 417 foot cream way more than I though I would. Actually I really loved the smell and feel of it and it did make my feet extremely soft….LOVED IT!! I will also say that I do like this month’s box much better than December’s box. The texture of the Royal Apothic hand cream was amazing, but I’m not sure I can get past the strong floral scent. I crave any sort of lip product and I am willing to try anything once but it’s winter GB!! I can’t wear MeMeMe’s Playful Peach right now, it was more like a Playful tease. 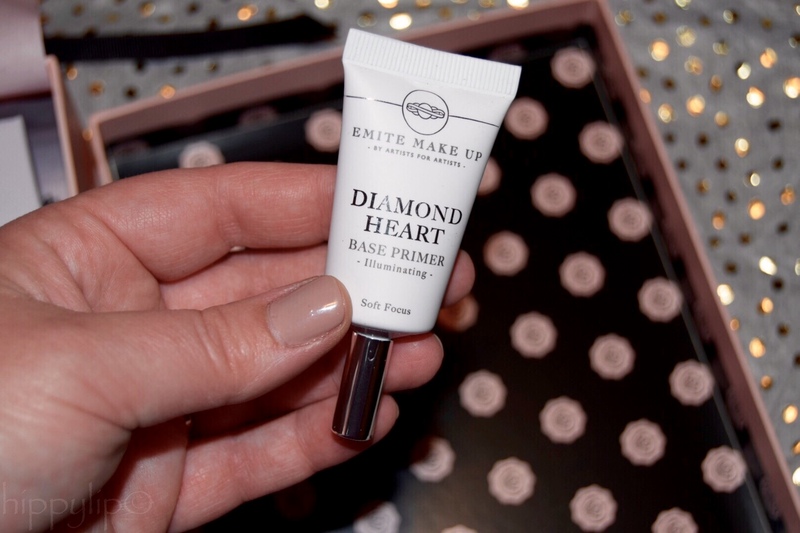 I am still on the fence with Emite Make Up’s Diamond Heart base primer. I can’t wear it alone (as it suggests) because it is transparent so unless you have flawless skin…..uh NO! I did try it once under my makeup and I was ok until I started to look extra radiantly shiny 3 hours in. I’m sorry, but I have to use this primer longer to know what I truly think. There was one HOLY GRAIL product this month that made my opinion, (of January’s box), sky-rocket a bit. Beautiful Nutrition Lemon Rinse. I can tell you that I have used this twice and both times I received multiple compliments on my hair. People were saying it looked so full, shiny, had tons of body….this in not me at all!!!! I am the girl with the flat hair that gets fully static at the thought of cold weather. 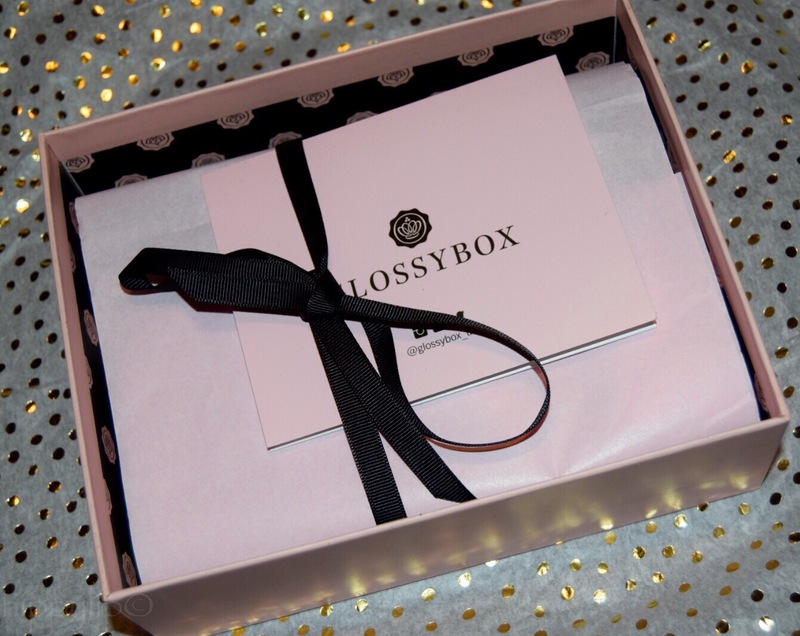 Here is to a better month Glossybox!! I can’t wait to see what February’s box will contain! Anyone else receive Glossybox? Any Opinions on December or January? Give me some LIP! I actually have Birchbox too and I really wanted more skin care products but I think you are right!!! Very similar. It did get much better the second month so we’ll see hopefully they match my profile better next time. I didn’t know Bocy Charm was all full-size!!! Hmmmm maybe my next sub after I cancel one or two. Lol thanks! !